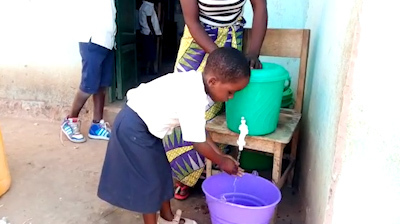 A simple song about hand-washing is helping save lives in the Democratic Republic of the Congo (DRC). “Lavage Des Mains” was produced by Harper Hill Global in conjunction with the United Methodist Church to raise awareness about prevention during the current Ebola epidemic in the country. Since last August, there have been nearly 1,000 cases of the virus resulting in more than 600 deaths. One of the most important keys to prevention is regular hand-washing, which is not always practiced in the region. Hekima has worked for a long time in the fight against cholera, but when the Ebola epidemic reached the DRC, it became a priority for him and his team of journalists. A member of the Harper Hills Global team, Serge Musana, asked if he could help get a program from the United Methodist Church played on his radio station. The hand-washing song was part of the program, which aired six times a day to a potential audience of 3 million people. Since May 2018, Harper Hill Global has provided almost $3,000 in media production and broadcast grants that distribute Ebola prevention messages to communities most likely to be affected. These efforts are working, but there is more to be done. For example, the “hand-washing song” has only been recorded in French, which is understood by about 30 percent of the local population. Hekima said the song needs to be translated and produced in Allur, Lingala, and Swahili in order to reach the rest. For the first two months, the show and the song were broadcast six times a day for free by the radio station as a public service, but now it’s down to just two or three times a day. Harper Hill Global is looking for partners to help fund the translation and production of the song in new languages, as well as to help purchase more air time so it can be broadcast more frequently. If you’d like to join us in this important, life-saving mission, you can give right now. For more stories on the work Harper Hill Global and The United Methodist Church have done to help prevention awareness in DR Congo, click here. Since May 2018, Harper Hill Global has provided media grants and communications leadership for The UMC of East Congo to reach those most likely to be affected by Ebola. Help us increase access to life-saving information. Please consider donating today! Harper Hill Global is organized exclusively for charitable, religious, scientific, literacy or educational purposes within the meaning of Section 501(c)(3) of the IRS code. Harper Hill Global empowers the human spirit through media, messaging and mobile solutions aimed at improving lives and relieving human suffering.